It is well known that about 40% of retinal ganglion cells (RGCs) are lost at the time of earliest visual field defect in glaucoma. The RGCs occupy the inner layers of the retina with their dendrites forming the inner plexiform layer, the cell bodies forming the ganglion cell layer (GCL), and the axons forming the nerve fiber layer. Together, they form the ganglion cell complex (GCC). If we had some mechanisms to measure the thickness of retina or more appropriately the decrease in thickness due to the loss of GCC, then that would be the best pointer for the preperimetric detection of glaucoma. Optical coherence tomography (OCT) is the machine which can actually measure the thickness of the retina, and that is why it has become so popular in glaucoma workup. About 50% of the RGCs occupy the perifoveal area of the macula. This means that the decrease in macular thickness would be the earliest pointer for the detection of glaucoma. However, the anatomy of the macula is marred by some conditions such as cystoid macular edema, diabetic macular edema, macular hole, and therefore, the specificity of this test for the detection of glaucoma is greatly decreased. Hence, the best way to detect glaucoma by OCT would be to examine along the entire length of the ganglion cell, i.e., measure the neuroretinal rim thickness on the optic nerve head (ONH), the retinal nerve fiber layer (RNFL) thickness, and the macular thickness and compare with the normative data. At present, the RNFL thickness has the best agreement with the diagnosis of glaucoma. ONH and macular analysis only have a complementary role. 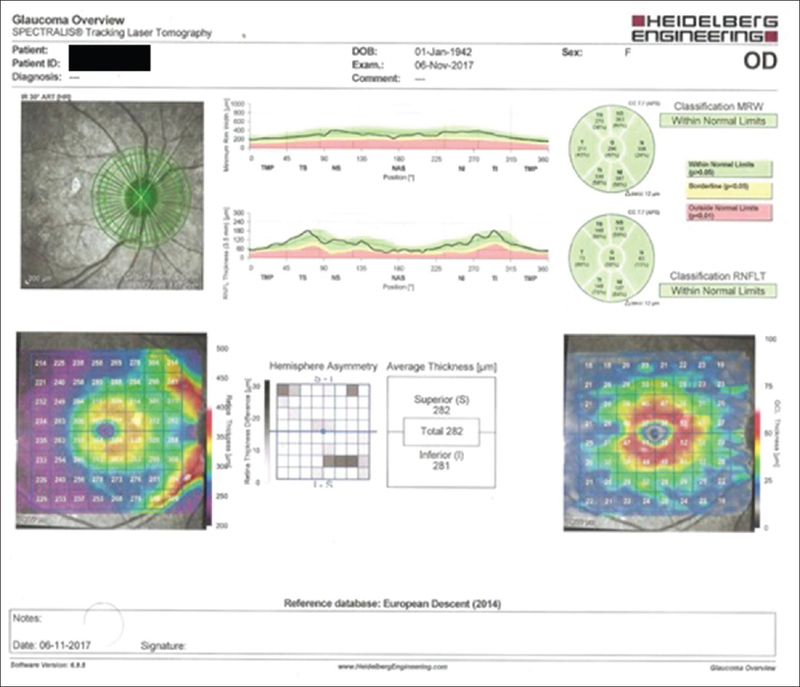 [Figure 1] is a SPECTRALIS printout with the upper part showing the ONH analysis, the middle part showing the RNFL analysis, and the lower part showing the macular analysis with the grid on the right showing the actual thickness of the GCL. The OCT identifies the termination of the Bruch's membrane as the limit of the disc. The Bruch's membrane is highly reflective and therefore easily identifiable. The machine performs a number of line scans and joins up the termination of Bruch's membrane in each scan to form the Bruch's membrane opening (BMO) – which is the disc margin according to the OCT [Figure 2]. The shortest perpendicular from the termination of Bruch's membrane to the internal limiting membrane (the line is shown in red) is called the minimum rim width (MRW). The OCT calculates the MRW over the circumference of the disc and plots it region-wise against the normative data which is shown in color-coded format. OCT also shows this data in a sectoral format. OCT measures the RNFL thickness in a circle. Usually, a 3.5 size circle is utilized, but 4.1 and 4.7 size circles are available to bypass any peripapillary pathology. It is important to check for the accuracy of the segmentation of RNFL on the screen rather than on the printout. The normal RNFL shows a slight double-hump pattern with the thickness increasing from temporal (T) to T superior (TS) with maximum thickness at TS, then it decreases and then again increases from nasal (N) to N inferior to T inferior (TI) with maximum thickness at TI [Figure 3]. We must look at the thick black line which gives the RNFL profile of the patient. In [Figure 4], we see that this patient's RNFL profile shows a wide trough-like area in the TI region where it ought to have been the thickest. This is a notch on OCT, and when this trough touches the baseline, the notch becomes visible on the disc. In the TS area, we see a dip downward. This is a potential notch, and these two areas have to be carefully watched for in subsequent OCTs. The OCT also depicts the person's RNFL profile in a sectoral format. It is important to remember that different machines have different color coding schemes to depict the statistical divisions of normative data. In the SPECTRALIS, if the patient's value falls within 0%–1% of normative data, it is shown as red; if within 1%–5%, it is shown as yellow; if within 5%–95%, it is green; and if >95%, it is white. If the patient's value is such that there are no normative data with the machine for comparison, it will be shown in gray. Further, it should be noted that different machines have different absolute reference values. Hence, you cannot compare the OCT taken by one brand of machine with the OCT taken by another brand. The RNFL thickness values have been obtained for the Indian eyes, and the average RNFL thickness is 102.75 μ. 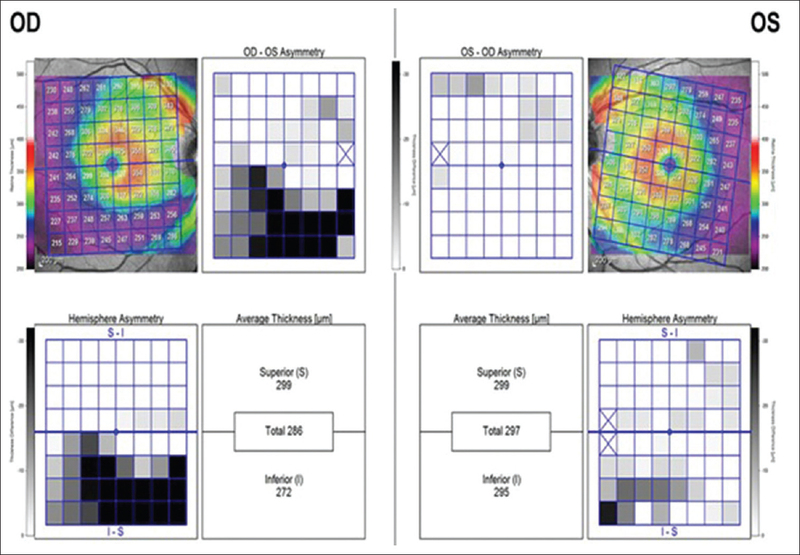 In the SPECTRALIS [Figure 5], a grid showing the thickness of macula is superimposed on a confocal scanning laser ophthalmoscopy image of the macula. 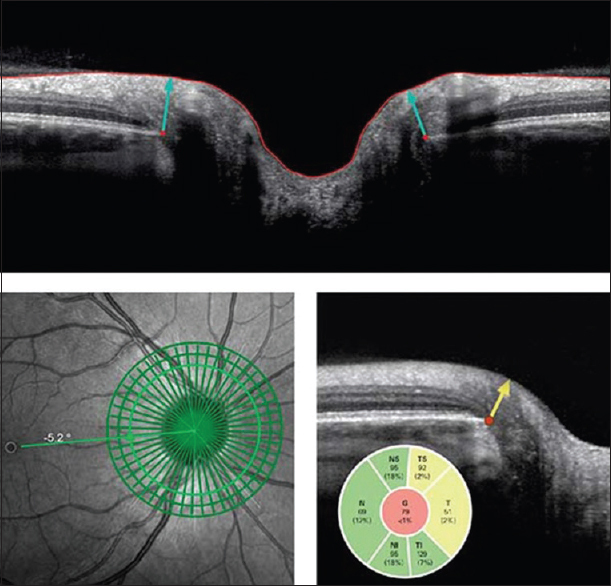 The OCT compares the thickness between the superior and inferior halves of the macula. Usually, the inferior half has a greater thickness. The OCT also compares the difference in thickness between corresponding squares on the superior and inferior halves of the grid and plots it in a grayscale pattern. If eight or more adjacent black squares are seen, it is suggestive of a parafoveal scotoma. It is to be remembered that in the SPECTRALIS macular program, there is no comparison with the normative data. The most important indication of OCT in glaucoma is to rule out glaucoma. According to the 2015 Glaucoma Society of India survey, both general ophthalmologists and glaucoma specialists ordered OCTs most in suspicious optic disc with normal visual fields. OCT is also used to detect glaucoma early, especially in people with a family history of glaucoma, in ocular hypertensives, in people who are too sick to sit for perimetry, when there are confounding disc abnormalities, or to detect glaucoma early in the other eye when one eye has pseudoexfoliative glaucoma. 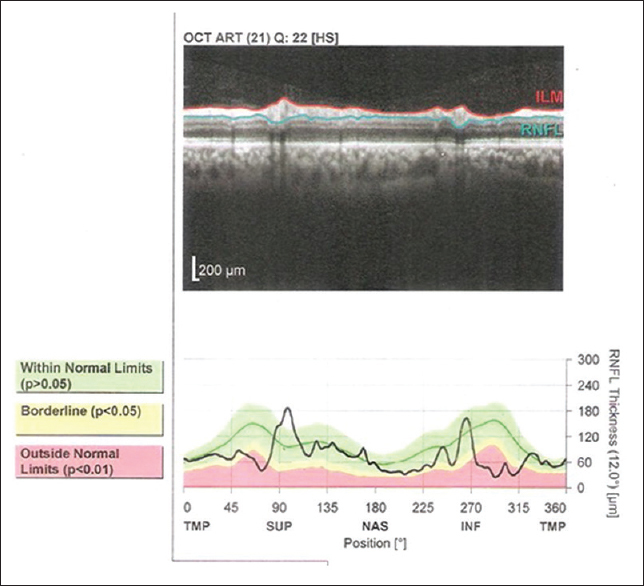 OCT is also used to detect the progression of glaucoma, but its use has not been standardized. A 20 μ decrease in RNFL thickness has been considered as progression in many studies. The anatomic positioning system (APS) of SPECTRALIS OCT creates an anatomic map of each patient eye using two fixed structural landmarks, i.e., the center of the fovea and the center of BMO. With APS, all scan protocols are automatically oriented according to the patient's anatomic map. This enables precise examination of relevant structures and ensures accurate comparison with reference data, allowing for a highly sensitive assessment of structural change. Head tilt and eye rotation affect the anatomical alignment of the scan. Fovea-to-disc alignment corrects for unwanted rotation and follows the anatomy of the eye. It ensures all circle scans start/stop at the same anatomical point, providing point-to-point accuracy between scans and eliminating alignment error in the database. Medeiros FA, Lisboa R, Weinreb RN, Liebmann JM, Girkin C, Zangwill LM, et al. Retinal ganglion cell count estimates associated with early development of visual field defects in glaucoma. Ophthalmology 2013;120:736-44. Zhang C, Tatham AJ, Weinreb RN, Zangwill LM, Yang Z, Zhang JZ, et al. Relationship between ganglion cell layer thickness and estimated retinal ganglion cell counts in the glaucomatous macula. Ophthalmology 2014;121:2371-9. Ha A, Lee SH, Lee EJ, Kim TW. Retinal nerve fiber layer thickness measurement comparison using spectral domain and swept source optical coherence tomography. Korean J Ophthalmol 2016;30:140-7. 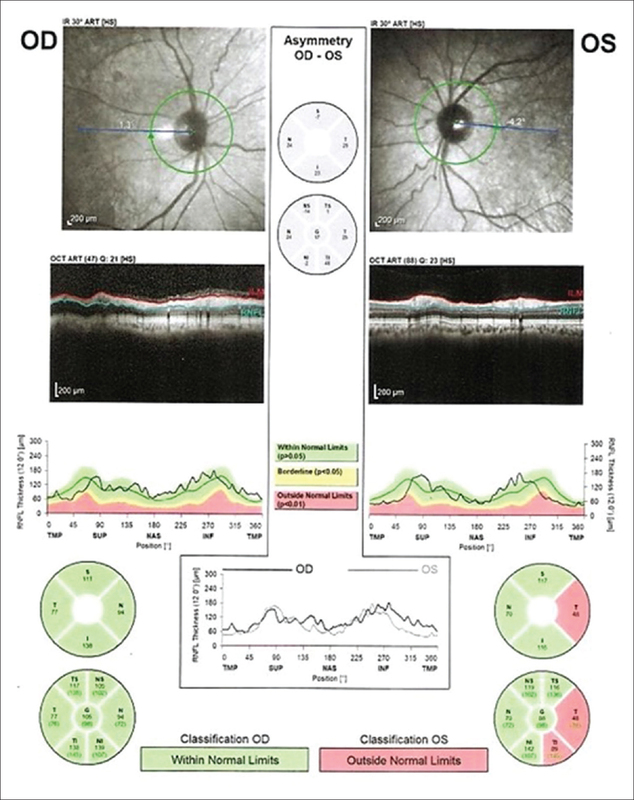 Sony P, Sihota R, Tewari HK, Venkatesh P, Singh R. Quantification of the retinal nerve fibre layer thickness in normal Indian eyes with optical coherence tomography. Indian J Ophthalmol 2004;52:303-9. Choudhari NS, Pathak-Ray V, Kaushik S, Vyas P, George R. Prevalent practice patterns in glaucoma: Poll of Indian ophthalmologists at a national conference. Indian J Ophthalmol 2016;64:715-21. SPECTRALIS OCT Hands-On Operator Course – Academy. Available from: https://www.academy.heidelbergengineering.com/course/view.php?id=195. [Last accessed on 2018 Jan 12].